Today's challenge is perfect for this time of year. It's a theme challenge with the theme of "4th of July" or "summer". How easy is that? Anyway, I hope you'll play along with our theme challenge this week. I would love to see what you create. 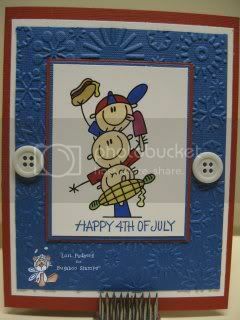 Lori, This is a fab use of the red, white, and blue color combo! Adorable image -- definitely boys who will grow into BBQ masters. lol So glad that I'm going to be guest designing for Bugaboo all through July. Obviously, I'm going to be in high talent company, and with luck, some of it will rub off on me. :-D! Hugs.